Most of us have multiple firearms by choice, but multiple holsters by necessity. Often we might buy 2 or 3 holsters before we find one that fits how we want and where we want. For the last 4 months I have been testing the Alien Gear Cloak Tuck 3.0 IWB Holster. The Alien Gear Cloak Tuck 3.0 IWB Holster is a hybrid holster. While some people may prefer all Kydex, for comfort I prefer having a large pad against my person, instead of hard plastic. While most hybrid holsters have a leather pad, the Alien Gear Cloak Tuck 3.0 IWB Holster has a neoprene pad. There are some pros and cons to this, which I will discuss later in this article. The outer shell is firm Kydex molded specifically to my type of firearm. Kydex is a firm yet form-able plastic material very commonly used in holster manufacturing both for its strength and ease of forming around the intricate shapes unique to each model of firearm. Having the firm outer shell is important for safety as you are “re-holstering”, or inserting the firearm back into your holster. Soft products such as nylon, rubber or supple leathers can sometimes cause negligent discharges if they lose their shape. The Alien Gear Cloak Tuck 3.0 IWB Holster has multiple connection points where you can attach the belt clips. This allows the individual to adjust the ride heights as well as the cant of the firearm. Adjusting both the ride height and the cant will affect the firearm’s conceal-ability and comfort. It will also affect the speed at which you may deploy your firearm from concealment, should the need arise. 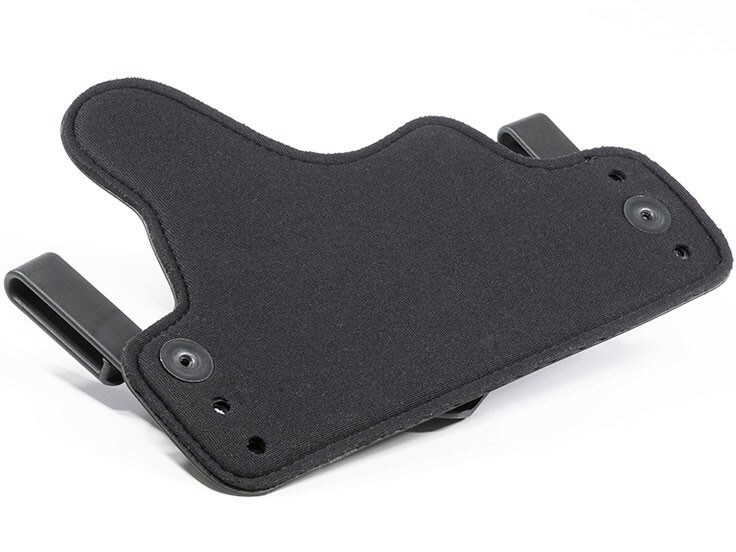 The kydex shell attaches to the neoprene pad with 4 screws and rubber grommets. These grommets allow the individual to tighten or loose, which tightness or loosens the friction retention on the firearm. If the friction is too little, the firearm could fall from the holster. If the friction is too much firearm draw may be very tight. I would suggest a dab of Loktite or similar thread locking compound once you have find your sweet spot of tension and friction. This thread locking compound will prevent you from periodically having to torque your screws. The standard clips included in the Alien Gear Cloak Tuck 3.0 IWB Holster are molded plastic. These clips hook nearly as well as “J” clips. In 4 months the holster did not become unhooked even once. Steel clips are also available. 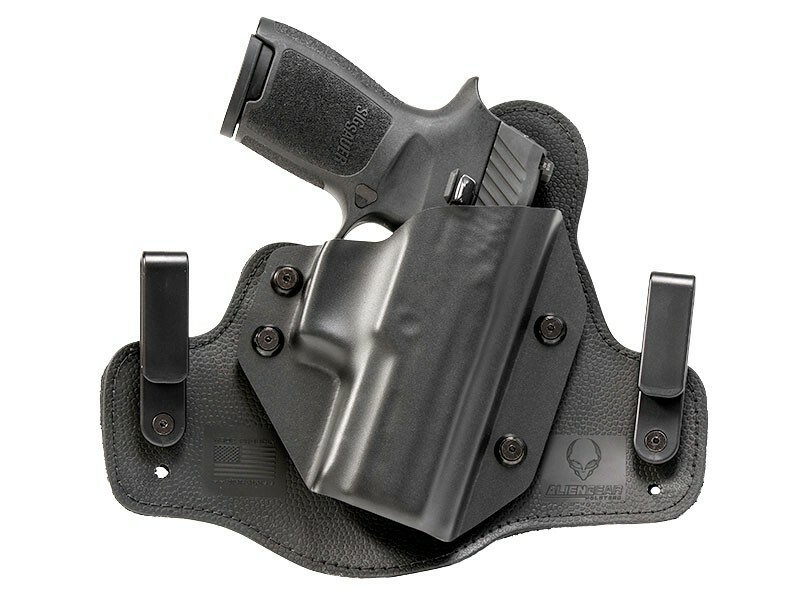 This Alien Gear Cloak Tuck 3.0 IWB Holster is designed for inside the waist band carry on strong side. I would not carry the holster at the small of my back or appendix. I typically carry my firearm at 2 o’clock to 3:30, although I did test the holster for comfort at 3:30 and 4:30. If you are left handed the holster would fit in the area of to 7:30 to 10:30. (Your belly button is considered 12 o’clock and your spine is 6 o’clock). Neoprene pad requires no break in period and is very comfortable against your body. Adjustable ride height and cant. Kydex shell completely covered the trigger guard (Sig Sauer p320 model), which is an absolute must for any holster. Neoprene pad doesn’t breathe as well as leather and can feel wet on hot days. Scuffs will occur to the holster backing after some time, from removal and re-holstering of the pistol. On a scale of 1 to 5, with 5 bring purchase and 1 being don’t purchase; I would rate this holster as a 4 for anyone looking for a hybrid holster.